Individuals who wish to pursue religious careers that deal with helping others with mental health issues commonly inquire about Pastoral Counseling Degrees. Those seeking to promote healthy interpersonal relationships in Christian communities often complete these degrees. These programs provide counseling instruction that focuses on spiritual aspects, and students learn about pastoral ministry and how it relates to counseling. Students are prepared to serve in various settings, such as churches, shelters, and missions. Courses typically include psychology, evangelism, theology, crisis counseling, and Christian apologetics and students learn about counseling methods by focusing on self-reflection and incorporating the concepts of the bible and the life of Jesus Christ. Graduate programs in pastoral counseling prepare students for licensure as mental health professionals. These programs include advanced study and practical experiences as directed by clinical counselors. Graduates of pastoral counseling degrees are prepared to provide psychological counseling that integrates spirituality into treatment methods. They are prepared for licensing and certification examinations and are prepared to become caring and compassionate counselors that provide actual solutions to an array of challenges. When searching for the best Pastoral Counseling Degree programs, students should consider schools that demonstrate the mission and values that will help them reach both their goals while maintaining their faith. All schools under consideration should be accredited to ensure they have met the necessary standards to offer high quality higher education. The ranking of an institution is also helpful, and many organizations, like the Princeton Review, rank colleges and universities based on varying features. Other characteristics to consider before choosing a program include cost, availability of instructors, support services, and spiritual extracurricular opportunities. California Southern University offers a top program in pastoral counseling. Its master’s degree program offers students benefits from an abundance of support from the faculty, staff, and administration. The program includes courses in human sexuality, psychology of religion, and psychology of death and dying. One of the best online Pastoral Counseling Degrees programs is offered by Colorado Theological Seminary. The school offers a doctoral degree in clinical pastoral counseling for individuals who already hold a doctoral degree in another discipline. The program does not require any dissertation and only four advanced courses are required for graduation. There are various Pastoral Counseling Degrees careers for graduates of these programs. Examples of possible positions include pastoral counselor, hospice minister, and youth counselor. 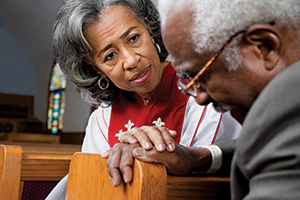 Pastoral counselors help people cope with mental health issues by integrating faith and spiritual aspects. They commonly work for churches, community centers, counseling organizations, and hospitals. Hospice ministers provide physical, emotional, and spiritual care to individuals suffering from terminal medical conditions. Youth counselors provide counseling services to children and adolescents suffering from mental and emotional issues. They typically provide both individual and group therapy sessions and some provide crisis intervention techniques. Many youth counselors incorporate religion and spirituality into counseling methods to help build a faith-based relationship with young individuals. The Pastoral Counseling Degrees salary differs significantly depending on numerous factors, including location, employer, education, and benefits. In general, pastoral counselors earn an average salary of $44,000 per year; hospice ministers $63,000; and youth counselors $35,000. Similar to Christian Counseling Degrees, Pastoral Counseling Degrees are excellent for those wanting to incorporate spirituality into counseling methods.